Warmer temperatures and eating outside go hand-in-hand, but picnics can sometimes lead to nasty surprises. Food poisoning is unsurprisingly more common in summer months. Every Australian experiences food poisoning about once every five years. For most people, this “gastro” includes diarrhoea and vomiting and may be mild, but it can be more serious. Children, older people, and those who have a compromised immune system are more likely to be hospitalised from food poisoning. Some more serious infections, such as Listeria, can affect certain groups such as pregnant women, leading to premature labour or stillbirth. Many foods can cause food poisoning, but some are more likely to make people ill than others. Meat, in particular, is commonly contaminated by bacteria, such as Salmonella and Campylobacter. It needs to be kept separate from foods that don’t require cooking. Utensils used for preparing raw meat should also be separate and not used for other foods. For picnics and meals outdoors, meats need to be kept refrigerated or in a portable insulated container, such as an esky, with ice before they are cooked. If you are using an esky or portable fridge, it is important to make sure that you change the ice regularly. Definitely don’t let meats and their juices come into contact with other foods that are eaten without cooking. Barbecues are a summer tradition. To avoid illness, meats should be cooked thoroughly. 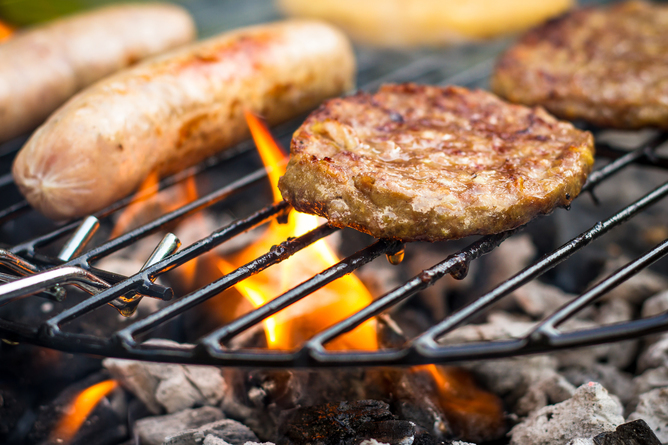 Ideally, use a thermometer to check the temperature of sausages, hamburgers and poultry, which should be about 75°C in the centre. It’s important to use a clean tray for cooked meat, and not the one that previously held raw meat, as the tray can allow bacteria to transfer onto the cooked meat. Some other foods that can cause illness include dishes made with raw or undercooked eggs, soft cheeses, and fresh produce. To prevent foodborne illness as a result of outdoor summer eating, it’s best to avoid dishes containing raw eggs, such as aioli and mayonnaise. Always use a clean tray for cooked meat – not the one that has been used to hold raw meat. Fresh produce, such as fruits and salad vegetables, need to be washed before eating, as they may be contaminated with bacteria or viruses. It’s also important to refrigerate foods you intend to eat outdoors, as bacteria can grow to dangerous levels in warmer temperatures. Another way to reduce the chances of illness while on picnics, eating outdoors, or camping is for people to wash their hands before eating; ideally with soap and running water. Soap and water is the most effective way to clean your hands, especially if they have visible dirt on them. If they aren’t available, an alcohol gel or hand sanitiser will do. It’s also particularly important that people don’t prepare food for others if they have gastro themselves, as they could contaminate food with bacteria or viruses. Most people think that the last thing they ate before becoming ill made them sick. Unfortunately, this can be difficult to tell, as most illness can take days to develop after eating contaminated food. And it is rare that there are leftover foods to undergo microbiological testing. The exception is when several people are affected. We call this an outbreak, and health departments can investigate affected people to determine the likely cause. Foods eaten by most of the affected people – and few of the unaffected people – are likely culprits. And poor food handling often plays a central role. Keeping food refrigerated, washing fresh produce, cooking meat thoroughly, and keeping raw and cooked meat separate can all help to prevent outbreaks. You can find more tips for safe eating at barbecues and picnics here.